What did you do to your non-motorcycle vehicle today? Topic: What did you do to your non-motorcycle vehicle today? Still left to do is to flush the trans fluid (I'll pay someone to do that) and replace the filter, replace the transfer case fluid, replace the rear tires, and last but not least a wheel alignment. Re: What did you do to your non-motorcycle vehicle today? i kan not speak english/but trying!! I had to do that on my MG a few years ago. I worked at splitting the pinch weld where the old floor pan was welded to the rockers on my old 69 firebird. I need to remove the floor flange and get the rust out before putting in the new floor. At first I'll screw/cleco it in until the rest of the sheet metal is fitted up. 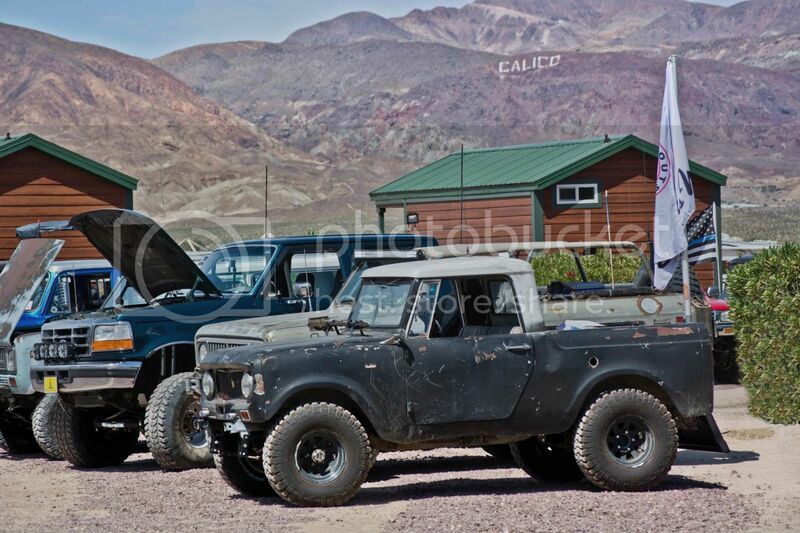 I'm hoping to buy a new roadster shop full frame for it. Installed a trailer hitch on my '09 Subaru Outback for the new motorcycle trailer I saved the wiring harness install for today (if warm enough). Danny, you spent $500 BUT how much did you save? im also velding a bit on my ford Taunus..most of the rear end is a bit toast..but the Cold..and my discos colaps is slowing me Down. just love that 1974 orange...and keep it that vay..it have that nice Knudsen front..make it a bit different then the ford cortinas...but both are komplet the same car..
At least $500. A local tire shop couldn't do an alignment because the ball joint on the right upper control arm was shot, they quoted me $300+ just to replace the one arm. I paid $98 for 2 arms with free shipping from Amazon Prime and did both sides. Replacing the plugs requires removing the intake plenum because 3 of the 6 plugs and coil packs are under the plenum. we got those cortinas here stynboen with 4.1 litre straight 6 cylinders and 4 speed manuals in them!they hauled arse! Danny, next week I will most likely be replacing the engine in my 2011 Cadillac SRX. We bought the car used with 80,000 miles from a Caddy dealer, they sold my wife on an extended warranty (an extra 100,000 miles) a few weeks ago while driving to Palm Springs, we lost oil pressure. Luckily we were only a couple miles out! Had it towed to dealer, they said the extended warranty company denied covering anything because of sludge buildup. I went to the dealer and saw the car in person. Brought all my oil, filter, air filter receipts. (8 times in 40,000 miles) It is the worst sludge I've ever seen. 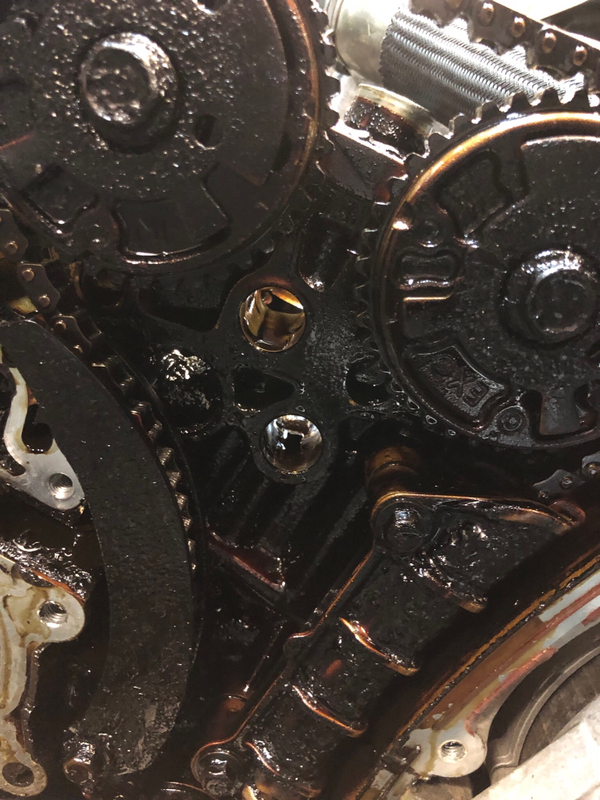 I remember seeing dark brown metal when I removed the cap to change the oil the first time, but I figured it was just oil on a diversion type tray under the cap that got hot. Nope, after the cylinder covers were off, that was the top of the head and the whole engine is covered in it. Basically I was sold a warranty on a car with sludge buildup, then they deny any claims because of the buildup. I'm sure the 3rd party company never inspected it prior to taking our money, so basically they gambled and lost. I have been fighting this for a couple weeks now, and I'm done. We have hired a lawyer, and I located an engine with 3k original mines on it that I'm going to swap in. I've got a copy of the factory service manual now and it does not look that hard. We'll see how it goes. I'll post pics of the sludge in a minute. man that's artery blocking crud?someone used cheap oil or few oil changes?coulda started from blocked pcv valve. It did have a bad pcv valve, I replaced it when I have the car a once over after she brought it home. 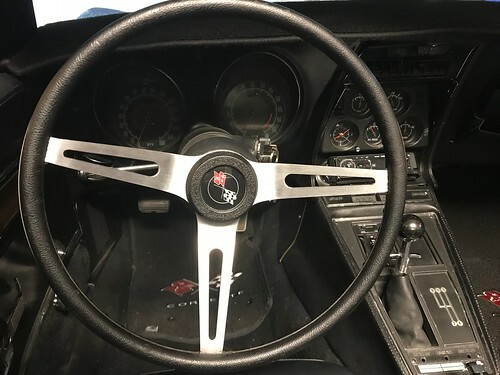 Put a new [used] OEM steering wheel in the Vette. It came with a crappy faus wood aftermarket wheel that looked crappy, I found this from a guy up in N Texas. It was dirty but cleaned up nice. Now need to figure out how to get the horn button on so the flags are oriented right. Davez, I bought mine in Sept 2016 with ~48k miles and it has 96k now. I've had engines out of 2 of my vehicles, my 1970 VW Karman Ghia and my 1975 Ford Fiesta. Both were much easier than modern cars based on the total lack of facy electronics and emission controls. My first gen SRX is RWD based, I think yours is FWD based, dropping the engine and transaxle out the bottom as a unit might be easier than pulling it out of the top. It is the worst sludge I've ever seen. That is ugly, my grandma's '68 Nova (307) and a '75 F250 (360) I had years ago were so bad when the rocker covers were removed, you couldn't see the rockers. The two engines shared something in common - run almost exclusively with Pennzoil. That's the reason right there I don't use Penz. I've seen it too many times Greg. Castrol GT or Valvoline are both high on my list for autos. Penz and Havoline are garbage. Pennzoil was my first thought as well. I switched to Valvoline after pulling the rocker covers on my sister's '64 Corvair to replace the push-rod tube o-rings; it was nice and clean, while the covers I'd just pulled from a VW motor run on Pennzoil, with a fraction of the mileage, were full of sludge. Don't fix it if it ain't broke! Right before Christmas I did a side job for a good buddy of mine's daughter's car. An 05 Kia Sorento with a v6 and 5 speed manual. 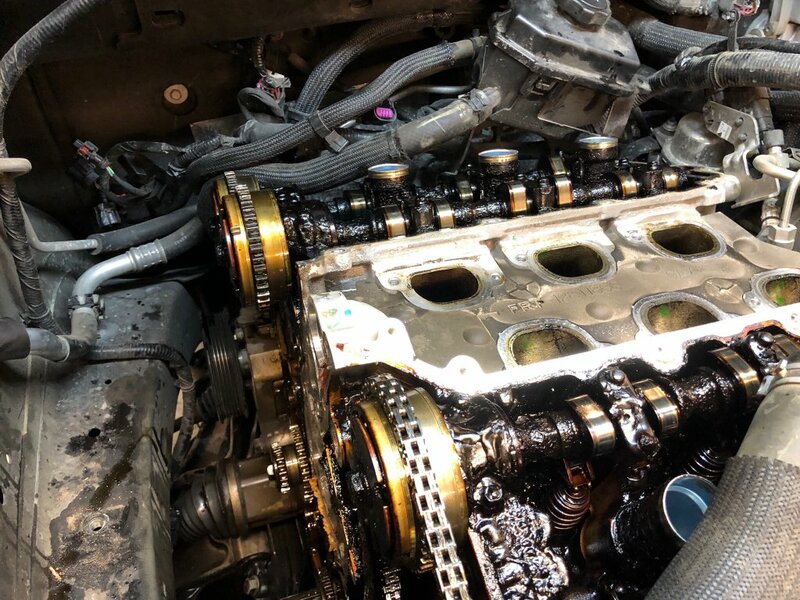 It had 135K and the timing belt/water pump was done last year. He wanted it dependable for her so he kinda had me look it over and do a tune up on it. 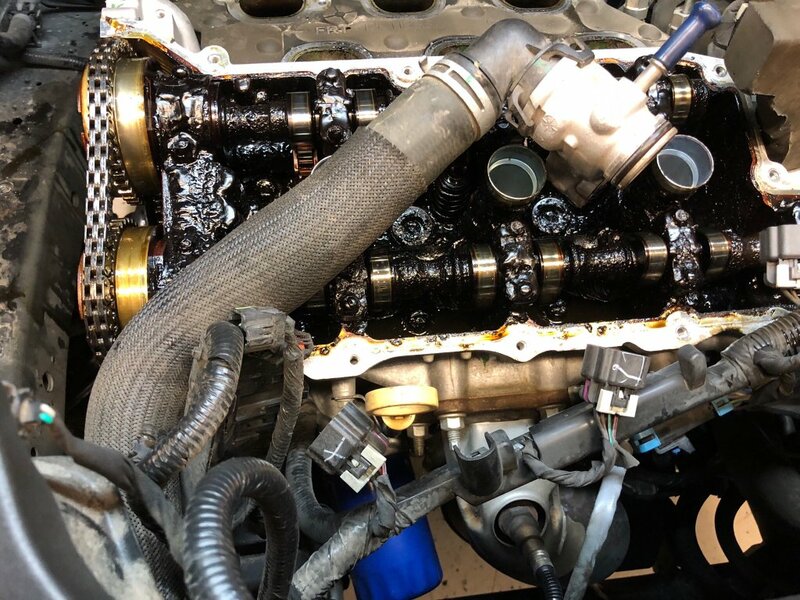 Had to pull plentum to get to plugs & wires and while you're there change the valve cover gaskets (which were seeping oil onto the exhaust manifolds) and 2 or 3 coolant hose that are near impossible to get at with the plentum on. One of the hoses was a Y pipe that was just starting to develop a leak in the Y joint. Also did front struts, rear shocks, and new outer tie rods and align. Everything went real smooth and it was a lot better to drive than before. Drove my 2001 Land Rover Freelander 2.5 V6 to work. A #$%* vehicle and you watch the temperature gauge more than the road. Finally got to changing the Tcase rear main seal on the Scout...what a PITA!!! It must have been the original cause it was hard as a rock, took forever to get it to back out, had to use a chisel to cut it to release some tension. Tomorrow I get to build a new exhaust for it. Would have done it today except while I was part running today the Ranger blew a heater hose so the rest of the day was spent fixing it. So, what do ya wanna talk about today? Back in 2002 I paid the princely sum of $2100 ($1500 USD) for a 1998 Hyundai Excel for the wife, who was sick of driving my Ford station wagon, and wanted something small. The Hyundai was cheap because it wasn't well looked after, the lady I bought it from was very economical with servicing, so it only had 2 oil changes in 60,000 miles! 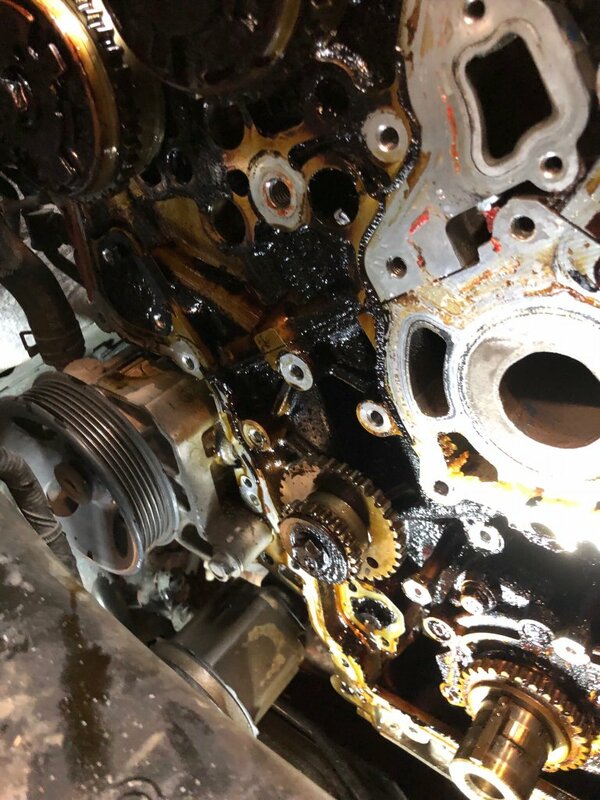 When I lifted the oil cap the sludge in the rocker cover looked like Davez pics, so I did a couple of oil changes and used some engine flush etc, and while it ran like a timex watch, it also ticked like one, due to crap in the hydraulic lifters. Being a cheap baastard, I always just put up with it, and to be fair, that little car has been fantastic, we've driven the wheels off the thing over the last 16 years, and it's still running fine. I was feeling sorry for myself because I couldn't afford new bike boots, until I met a man with no legs. So I said, "Hey mate, you haven't got any bike boots you don't need, do you?" my wife bought a 1999 excel new and still has it,ive done timing belts/brakes and services etc all on time,only had to replace a slightly leaking fuel pressure regulator,the rear shocks a crank angle sensor,water pump and radiator in all that time,its a little champ with good paint,too bad its worth #$%* all. Well you're lucky your paint's still good Dave, mine is farked. Still, one timing belt, one battery, one windscreen, one set of tyres and one set of brake pads isn't bad for 20 years of reliable service. got the nev marster clutch pump..from Berlin. .it set me back 270 kr. I tried to swap out the flexplate on our dragster. Of course the new one won't go on. The dowel hole is either off center or too small. I honed it a little and still no joy. Whaddda you want for $250? Perfection? The old one is fine except the cert is expired and I don't think anyone re-certs flexplates. Bad Behavior has blocked 1201 access attempts in the last 7 days.